Giorginio Wijnaldum and Roberto Firmino's strikes were enough to see off a solid Tottenham side on Saturday at Wembley stadium. Liverpool won the Premier League match 2-1. 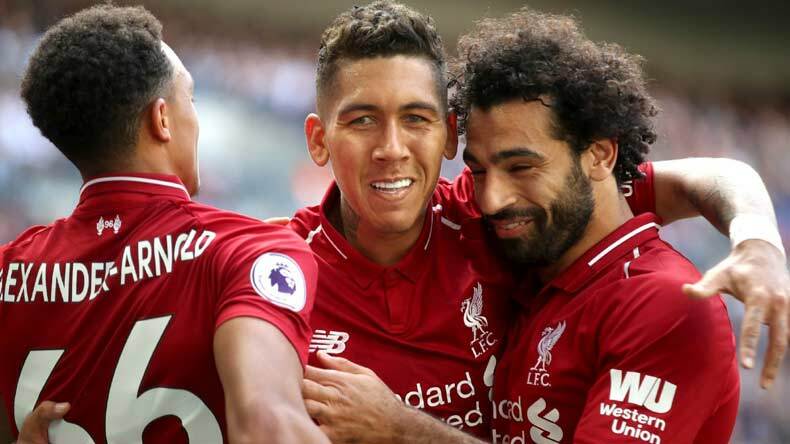 A rampant Liverpool side continued their unbeaten run in the Premier League 2018-19 season on Saturday after registering a hard-fought 2-1 over Tottenham Hotspur at Wembley stadium. Jurgen Klopp’s men came out of the match with all the three points thanks to Giorginio Wijnaldum and Roberto Firmino’s strikes. The only salvation for Tottenham came from Erik Lamela who scored an injury-time goal. Liverpool started the game strongly putting Tottenham at the backfoot and making light work of them. The Reds kept possession in the middle of the park for a large duration in the first half but a rock-solid defending by Mauricio Pochettino’s men gave little room to the travelling side to capitalise upon. It was in the 39th minute when Wijnaldum directed a powerful header at goal which Michael Vorm, who was deputising the injured Hugo Lloris, managed to push away but got late. The ball had already crossed the goal-line when Vorm pushed the ball and the goal was granted to Liverpool. However, in the second half, things improved significantly for Tottenham as they took charge in the game and had a fair share of possession of the ball with them. But it was still not enough for the counter-attacking threat that Liverpool was mounting on the home side. Roberto Firmino piled more misery on Tottenham after goalkeeper Vorm failed to collect a ricochet and gifted it to the Brazilian striker, who duly converted it. After the 2-0 lead, the Reds comfortably sat deep and snuffed out any danger that Harry Kane and company posed to their defence. The only salvation for the home side came through Erik Lamela who converted a ball delivered to him by Christian Eriksen. Liverpool has now won five out of their five Premier League matches this season and sits at the top of the league table. On the other hand, it was the second defeat for Tottenham in five matches and they now lie at the 5th spot.